Thoughts on being a CNA in Nursing school. Is it a good idea? I did. I worked Home health part time. The people let me practice the head to toe assessment on them. One guy actually came to graduation for nursing school. I still talk to his wife 8 years later. My patient tonight asked me why the nurses had so many patients, she was concerned she hasn't been taught what she needed to know to take her preemie baby home. How do you explain that management doesn't care if we are under staffed and over worked. I have on average 5 to 6 couplets a 12 hr shift at night. That's 10 to 12 patients, teaching is the furthest thing on my mind. Which should be the first thing I should be doing. We are told there is a hold on hiring due to the end of the fiscal year. Our patients are suffering and recently people are quitting or going prn to get away from the stress. Our spirits are breaking but we're told to stop talking about it. It's bringing the moral down. "I Narcanned Your Honor Student"
You are new. As the years go by as a nurse there are many oxymoron in a carrier. Our humor is dark because most of what we deal with is dark. I thinks it's funny. Some of the outside world look at things in example an A student and feel it's great, but under all the happiness the students given into temptation to use drugs to help them perform better to get the A in school. Overdoses happen, alot actually. Or 14 year old becomes pregnant. Or your star athlete uses anabolic steroids. You will see it if you make it through nursing school. 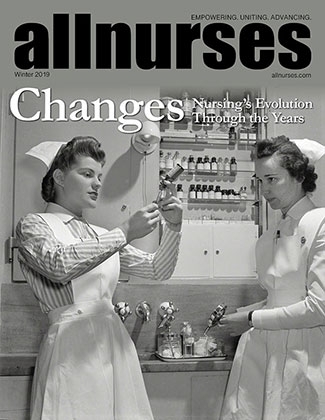 Is bedside nursing still a lifelong career option? I was diagnosed with bipolar in 2000. I take my meds every day. I can't function at full capacity without them. I know I have a chronic medical condition. Its not any different from diabetes, heart dx, hypertension. You need to look at it as a disease instead of a mental illness. I lost friends, jobs, mates before starting my medications. I did not function normal before the meds. The question I have for you, do you like the way you are when not on meds? If you don't then stay on the meds not only for yourself but for everyone around you. You might not die from not taking your meds like other chronic medical condition but it does alter your capability to function normal. When you working with patients haven't you seen the deniel stage when diagnosed with a chronic disease. You are no different. Please Lord, give me the strength to finish this day. Shhh Listen, I think I heard it thump thump. I just left a hospital system that is on the brink of collapse. Patients are telling me that they will not go to this hospital for acuite care and would rather drive 2 hours away to see the system I now work for to be hospitalized. The draw back the previous company is the only hospital in our area and employs a lot of people. They have tried to sell out but no one will buy because none of the vice presidents want to leave after the new company takes over. They are so oblivious as to why the company is going down the tubes. They are the cause. Male student nurse interviewing for Postpartum.. In the dept I work in we have 1 male nurse he mostly works with the newborns. Most of the mothers request to not have a male nurse. Primarily because of the help needed with breast feeding. NICU might be a better fit. You will be working with the mother in a different way primarily as support and guidance. I work in acute care now I don't think I would do it again. Teaching is what I enjoy I think if I would have went to school to become a nursing instructor I would have enjoyed it more, but hind sight is always 20/20.